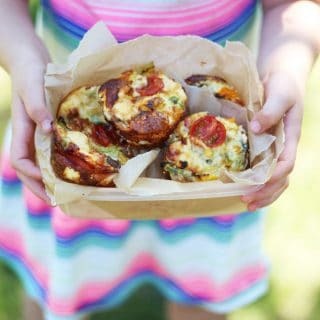 Mini crustless quiches with no pastry, perfect for lunchboxes or even breakfast. Filled with peppers, mushrooms and tasty ham, this healthy mini quiche recipe also happen to be gluten free. Grease a 12 hole muffin tray well with olive oil. Cut each ham slice in half lengthways and use it to line the bottom and sides of each muffin hole. In a jug, beat the eggs and milk. Put a little mushroom and peppers into each muffin hole. Top with half a tomato and some cheese. Pour the egg mixture evenly between each mini quiche. Bake for 25 - 30 minutes or until well risen and golden.